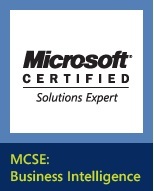 After successfully completing steps 1-3, you'll earn a Microsoft Certified Solutions Associate (MCSA): SQL Server 2012 certification. Become an expert on SQL Server 2014 and the Microsoft data platform with new in-memory capabilities, faster data insights and cloud capabilities that help you simplify cloud adoption and unlock new hybrid scenarios. Access the latest resources including virtual labs, virtual events, online training, certification, and more that will enable you to make the most of your SQL Server investment.